Last May when I visited the Langhe to taste more than 200 embryonic Barolo and Barbaresco wines in this year's en primeur Nebbiolo Prima tastings, it struck me that such density of vine plantings must have a huge impact on soil health. Although quite a few Piemontese producers do practise sustainable methods, with organic as well as biodynamic viticulture, the majority of growers and producers still stick to conventional methods. Now that the fine-wine debate seems more and more in favour of organic and biodynamic approaches (with the myriad confusions and misunderstandings that come with them), most producers are at least aware of the issues. It also seems highly likely that European wine law will move increasingly towards regulation in favour of sustainability. But many Langhe producers seem to be sceptical of, and sometimes downright hostile towards, any alternative to conventional viticulture. In some cases I received such elaborate or evasive answers to my questions about the possibility of implementing organic methods that I felt I was touching a taboo. And the way it is with taboos, once they are in the open, it is difficult to shove them back into the dark. During my recent visit to Barolo, I went to see Giuseppe Rinaldi (pictured above) of the eponymous Barolo estate, a Langhe stalwart when it comes to organics. While sitting down for lunch with the Rinaldi family at their home just outside Barolo, their 2008 Langhe Nebbiolo being poured, I asked whether it was possible to practise organic methods in a region so densely planted with vines? I could not have put a worse question to Giuseppe Rinaldi. Immediately I was being told off for trying to pigeonhole him. He won't have it, won't allow it. Not a good start to my visit. For the uninitiated: Rinaldi tends its vineyards organically, doesn't use any cultured yeast, no temperature control, and his Barolos get very long skin maceration (see below). If all of this weren't enough to put Rinaldi automatically in the traditionalist corner, the estate is also a member of the Vini Veri, or real wine association, where nomen est omen. However, it is being made abundantly clear that Rinaldi doesn't want to be segregated from his fellow Barolisti. But the topic, just like the family's cute little dachshund snapping at my heels, doesn't want to go away. So I took a deep breath and tried again: 'why do the Piemontese no longer use the ancient methods of vine cultivation - methods that have now been adopted by many producers following organic and biodynamic principles?' Unfortunately the response was no less firm. 'Because the situation is completely different from the time of our grandfathers', Giuseppe snapped back, adding, 'keeping 10 chickens is very different from keeping 10,000. It changes the work as well as the environment' just in case I didn't get it. In the meantime my plate was filled first with spaghetti al pomodoro, then with bell peppers conserved in nebbiolo pomace and vinegar. Cheese and persimmon are to follow. It is whip and carrot. Why Piemontese producers regularly rely so faithfully on chemical treatments I gather has to do with a trauma caused in the recent past by flavescence dorée, a grapevine disease (but also known to affect other crops) for which there is no known treatment. The disease is, among others, spread by an insect, the leafhopper, and insecticides seem to reduce the occurrence of flavescence dorée. No wonder organic viticulture has yet to catch on widely in the Langhe, but it doesn't really explain the irritation I encounter again and again, when posing the question while in situ. Rinaldi continued by saying that he doesn't take a stance on the organic debate and, at least to me, plays devil's advocate when saying he actually believes that chemicals have improved the wines from the Langhe. But before I have the chance to ask why on earth, if he doesn't want to take a position in the organics debate, is he a member of Vini Veri, he does a U-turn and says, he of course takes sides. He went on to explain in more detail. Not using any chemicals means the costs per hectare go up, and the wines become much more expensive. For a producer of Barolo or Barbaresco who can expect a high return (at least until the recent recession), it is less of a challenge, but 'if you are a producer of Dolcetto the market will not want to pay the premium that comes with organic cultivation methods'. In addition, there are many farmers who only grow grapes and sell them on. If their fruit looked less than pristine, they would be unable to make a living. Although this sounds more than logical, I can't help thinking that agrochemicals are some of the most costly products, and a bit like an addiction: every year the vines and the soils seem to need more to achieve the same results. But there was a point where the use of chemicals became a problem, even for the most conventional producer, be it of grapes or wines, explains Rinaldi. Chemical treatments against botrytis and fungus readily used in the vineyards started to inhibit the fermentation of the grapes once they were in the tanks. I understand that even adding cultured yeast didn't immediately solve the problem. All this triggered the idea that there had to be some brake on chemical treatments. And Rinaldi and I agree on one point, thank goodness, that even if a neighbour practises conventional viticulture, and is potentially the cause of contamination, that is no reason not to practise organic methods. Talking to Rinaldi is great fun, at times scary, but mostly hugely entertaining. His, at times cryptic, replies inspire lively discussions, and he doesn't seem to be a man to appreciate shyness in his conversation partner. His nickname Citrico, meaning 'citric', should have been a warning to me, but his combative conversational style only encouraged me to probe the core of the Rinaldi philosophy further. Rinaldi is very much part of the Barolo fabric (a reason he doesn't take what he perceives as criticism of his community lightly), with the estate founded in 1899. A trained veterinarian, and fifth generation of a wine-producing family, Giuseppe initially seemed to be going in a completely different direction from his father, the iconic Battista Rinaldi. He was custodian of some of the finest vineyard sites in the commune of Barolo: Brunate (of which a part lies in La Morra), Le Coste, Cannubi San Lorenzo, as well as Ravena in Monforte d'Alba. The first from Barolo to graduate from the oenological School in Alba, Battista played a fundamental role in this commune, first as a mayor, but more importantly he was instrumental in the acquisition by the municipality of the castle of Barolo, which became the home of the enoteca of Barolo. After his father passed away in 1992, Giuseppe took over the estate and, owing to his firm traditionalist stance and winemaking, his Barolos, which need long ageing, soon found a devoted following of wine writers and wine lovers alike. It would be all too easy to put Giuseppe Rinaldi in the traditionalist corner. He ferments in the tronconic oak vats called tini shown here, and leaves his Barolos plenty of time to macerate on the skins, a month or more being the norm. Maturation is in large oak casks only, and there isn't a single barrique to be seen in the Rinaldi cellars. There are two of the basket presses which have become the norm for many quality-focused Barolo producers. Malolactic fermentation happens spontaneously, and the wines are only racked, never filtered. But even more remarkable is the fact that the Barolos Rinaldi produces are blends of different vineyards. It is this, more than anything else, which is considered ancient practice (although some journalists have expressed doubts whether multi-vineyard blending really is so traditional), while most Barolo and Barbaresco producers choose single-vineyard wines to represent the very top of their production. Not Rinaldi, who blends Cannubi San Lorenzo with Ravera and Brunate with Le Coste. According to Rinaldi, the multi-vineyard site blends allow for more harmonious, more balanced wines. Even if the Cannubi vineyard, a sizeable chunk of 15 ha divided among many owners, is considered one of the very best in the region, dry years can cause water stress, potentially resulting in lower must weights. According to Rinaldi, blending can help to obtain the very best wine possible while taking vintage differences into consideration. For Rinaldi it is not so much tradition as history that is the most significant factor in the character of the wines. 'If a region forgets its history, it loses its identity and starts to experiment.' Rinaldi told me that the styles resulting from experimentation are always completely different from the ones obtained by experience. I gather that 'experience' in this case refers to the knowledge acquired by many generations, while experiments involve the introduction of modern techniques to the cellar, which in the recent past divided Barolo producers into opposing camps. But Rinaldi assured me he is not necessarily against modernisation, it is just that one should not expect a revolution from it. For Rinaldi the modern revolution that had the biggest impact on the wines of the Langhe was the availability of water in the cellar. It improved cleanliness, which in turn improved the wines. Cleanliness allows a clearer expression of terroir. 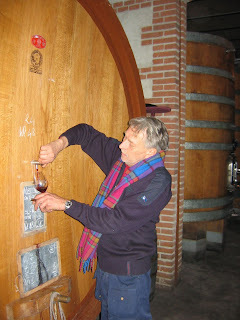 After cheese, fruit and cigar (for Rinaldi, not for me), I feel I may finally have passed the test, and Rinaldi takes me to the cellar to taste the 2008s from barrel. At lunch I was served an unlabelled Barolo that turned out to be the first wine below. The next two wines were tasted from large oak casks and technically may not be called Barolo before their release in 2012.